There’s no doubt that B2B products and services are complex. It’s an artform to create simple and clear messaging around them, but high-conversion B2B landing pages have an eloquent way of doing just that. It all revolves around good copy, presentation and a simple way to tell people what they should be doing next. Altogether, they put the user first, answer their questions, communicate value propositions clearly and convert website visitors to leads. Since landing pages exist to serve one purpose—getting website visitors to convert to the next stage in the buying journey—let’s take a closer look at the details that separate the excellent from the good. 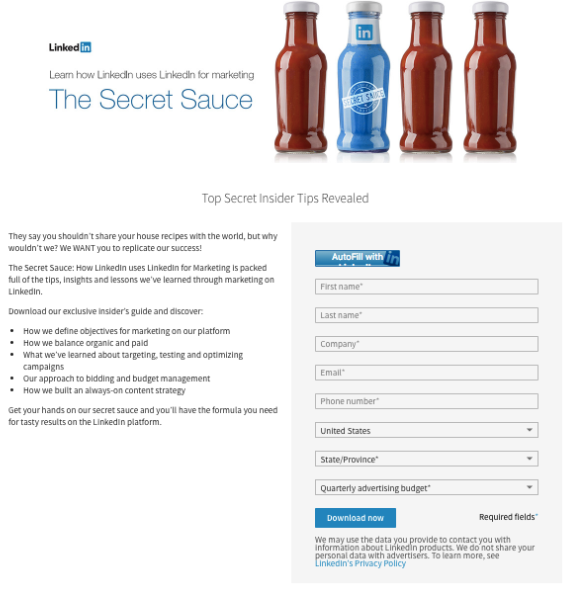 As a starting point, let’s look at one of LinkedIn’s Marketing Solutions landing pages. On the page you will see that there is no navigation menu, a clear header and a form that lets visitors know what their next action should be. As you design your landing page, keep in mind who will be visiting your landing pages. You want your copy, design and form length to match up who will be downloading your offer. The form also has an “AutoFill with LinkedIn” button, which makes filling out the form and downloading the content faster for visitors. The easier you can make your visitor’s experience, the more likely they are to convert on your landing page. Have you ever visited a web page and clicked off if you felt like the task it wanted you to complete took too much time? I know I have! Your landing pages should always provide something of value to whomever is looking at it. There are many different ways to deliver value—from a whitepaper, ebook, webinar or a more complex tool. When you have a great offer, ensure that the form length on the page matches the value of that offer (i.e., you can ask for more information from a visitor if you have something awesome to offer). One of the best examples of a great offer that has withstood the test of time is HubSpot’s Website Grader, which has been a backbone of the company’s lead generation strategy since HubSpot’s inception. The additional benefit of an offer like this is that it invokes immediate action from the user, since it give both a personalized grade on the performance of his or her website and an immediate list of action items that can be improved. Factory45 builds credibility on their landing pages by adding customer testimonials to their footer. Testimonials give prospects insight into how your current customers perceive your worth. Customers willing to vouch for your work is a positive sign that their expectations were met. What has gone well in the last 6-12 months? Have you ever recommended us to a friend or colleague? Would you? If their answers are generally positive, this is a good time to ask them for a testimonial. Salesforce has plenty of landing pages off of their main site where they can capture people's information. One of the cool ways they’re doing this is offering “free” content that gets you interested—then they gate content as you continue reading. If you click on “What is CRM?” in their website footer, you’re taken to what seems to be a typical blog page. There’s a lot of good information, visuals and videos on this page for people to view. At the bottom you see a “Next Chapter” button which takes you to another page, with some free content, and then the copy fades to a “Read More” button. When you click on the read more button you are taken to a landing page with all of the landing page best practices you should have. This content offer will then fill the gaps that the “free” content didn’t. 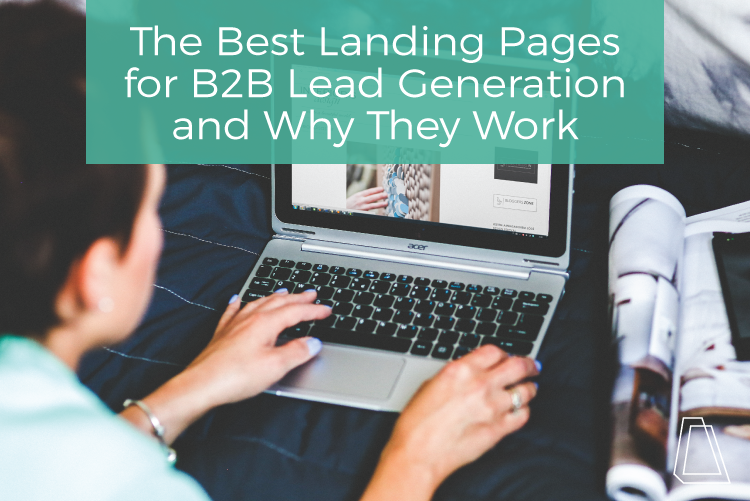 Landing pages are great for B2B lead generation and share your valuable content. As you can see, there are many different ways to design, lay out and use your landing pages. Don’t be afraid to test different options and see what works the best for your company. Do you have other landing page best practices that you have found generate leads? Share them in the comments down below! If you’re looking for additional landing pages best practices, check out our checklist!